The government has asked owners of container freight stations (CFS) to set up base in Nairobi as it downplayed reports that increased cargo transportation via the standard gauge railway (SGR) cargo train has rendered many in Mombasa jobless. Transport Principal Secretary Paul Maringa said that ferrying of cargo through the SGR has brought more gains to the economy, ensured efficiency at the Mombasa port and saved roads from overloaded trucks. "We cannot continue having the conversation about Mombasa and Nairobi. We must look at the bigger picture. We are encouraging the CFS owners to come and open their stations in Nairobi and other parts of the country Prof Maringa told the Daily Nation by phone. Some seven trains ferrying 752 containers leave the port of Mombasa daily for Nairobi. About 1,300 containers arrive at the port daily. Asked whether players in the sector should concentrate on investing in Nairobi, the PS said, "We should not lose the direction. Let's look at things holistically. We have been able to attract more business at the port which is benefiting Mombasa and the country at large." He said following the efficiency in movement of cargo, the Kenya Ports Authority (KPA) has increased its capacity to hold more cargo, boosting the economy. A ship which used to take up to 12 days to clear cargo at the port, he said, is now taking a day and a half. "And this is because of the speed that the SGR has been able to transport cargo to the inland container depot in Nairobi compared to the trucks. We have added handling capacity at the port and that is beneficial to all of us," he said. In the last two months, he said, the port has handle at least 17,000 containers. Prof Maringa said the cargo trains cannot not ferry all the goods at the port, leaving some for road haulage. He said by using the train line, the government has saved money for other development projects. "The accidents cases have also gone down. Those are the silent benefits of the project as Kenyans' lives are more important than the businesses we are doing," he said. 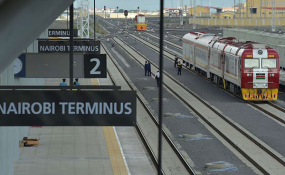 The PS said the extension of the SGR line to berths at the port for ferrying of conventional cargo to Nairobi will be complete by August. Hundreds of CFSs workers and drivers in Mombasa have been rendered jobless as the goods transported by train through the SGR increase. KPA issued a directive in June that containers destined to Mombasa for local clearance would not be allowed to be nominated by clients or bills of lading endorsed to any CFS. The Nation has learnt that CFSs and transport firms in Mombasa have started laying off workers following lack of cargo to handle. More than 500 truck drivers and 100 workers in CFSs have been declared redundant.